Are you looking for a dog that is really in need of comfort and some TLC? I’m Rhonda a very sweet 1 1/2 year old Pit mix who is sensitive. There isn’t a mean bone in my body, and I do great with other animals. In fact, having a canine friend will really help me out of my shell and having a doggy companion is mandatory for my successful adoption. 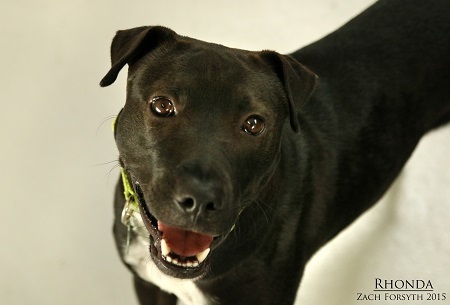 Once I blossom in my new home I’m a fun loving, zoom around the yard, affectionate kind of girl! I love to play with my doggie friends, so a home with a backyard would be ideal. After a few rounds of fetch I know we will become great friends! Because of my breed it’s best that I go into an owned home, and since I do need extra help and patience gaining my confidence I prefer a home with older kids. I am fixed, vaccinated and microchipped. My adoption fee is $250 and I’m currently living in foster care.